This is a student art gallery show at the Elora Centre for the Arts, featuring juried work that draws upon trees as creative inspiration. 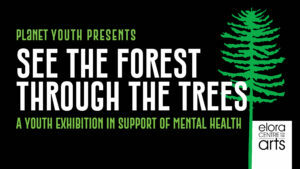 We will celebrate the strength, healing and resiliency found in trees and highlight how we can learn, grow and face challenges like they do, despite the storms that come. High school students and elementary students are invited to submit work. Selected juried submissions will be featured in the exhibition. Prizes will be awarded for top entries. In partnership with the Neighbourwoods Tree Mapping project, students will learn about 12 key landmark trees in the community as a benchmark for inspiration. Students interested in submitting work or finding out more about the criteria, please click here. Teachers can view and download program guidelines here. Opening reception will be held in the Minarovich gallery at the Elora Centre for the Arts on Saturday June 1st from 2-4PM. This is a collaborative project with Neighbourwoods Tree Mapping Project, with assistance and support of YouthTalk and the Upper Grand District School Board.